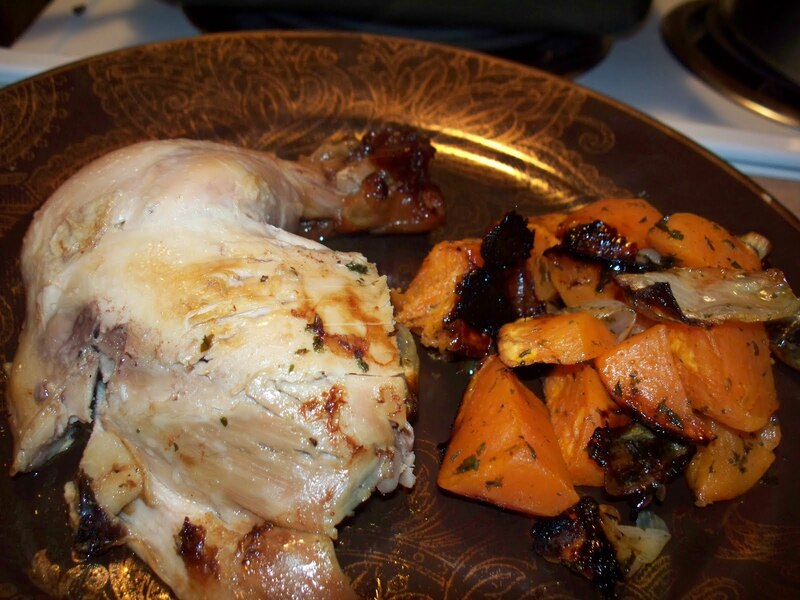 One of the easiest (and cheapest) ways to feed a lot of people is with a whole chicken. It’s great if you have a group to feed or are trying to stretch your budget. It’s also a quick way to make healthy meals throughout the course of the week. Chicken tastes good as a leftover and is simple to store. When I roast a chicken I add herbs and spices based on my mood and the season. The recipe below is a pretty standard year-round way to prepare a roast chicken, though you may want to experiment with your favorite spice. You can also easily substitute the wine with orange juice or the honey with maple syrup to further tweak the flavor profile. Remove the giblets and neck from inside the chicken. Rinse the chicken in cold water and pat it dry. 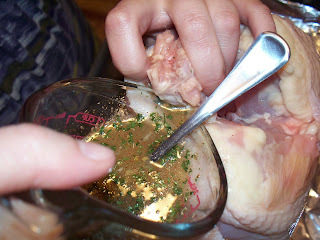 Use your fingers to loosen the skin around the neck, bottom, and underside of the chicken. Combine all other ingredients (except the onion and whole garlic pieces). 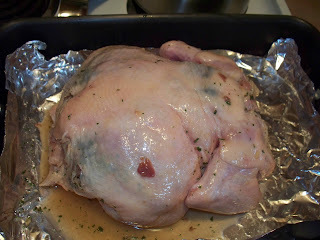 Rub the mixture into the chicken by pouring it into the space you’ve created between the skin and the bird. 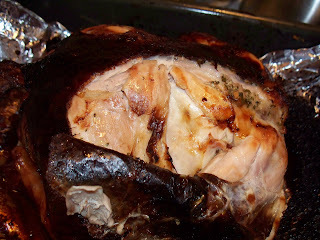 Use all of the mixture and alternate between pouring the mixture into the crevasses and using your fingers to rub the mixture in and around to ensure as much of the chicken directly under the skin is coated. Place the onion and garlic pieces inside the cavity of the chicken. Arrange the chicken breast-side up on a foil-lined roasting pan. Cover the bird loosely with a tent made of foil and bake for 30 minutes. After that time, remove the foil and bake uncovered another 30-45 minutes (depending upon the size of the bird). Please note that the skin will blacken due to the honey, but when you peel back the skin you’ll have a beautiful moist chicken. Let it stand 10-ish minutes to rest before carving the bird. Carve, discard the skin and the onion/garlic pieces, and serve! chicken, leah charney. Bookmark the permalink. Post a comment or leave a trackback: Trackback URL.